The Covered Outdoor Learning Area, or COLA, construction at the Cape Byron Rudolph Steiner School includes some unusual features. The multipurpose concrete court and shade structure was designed and constructed by Spantech in conjunction with architect Julie Lipset. The beams near the apex of the roof were installed to allow aerial circus training. The structure easily supports the additional load of two people swinging from the beams. 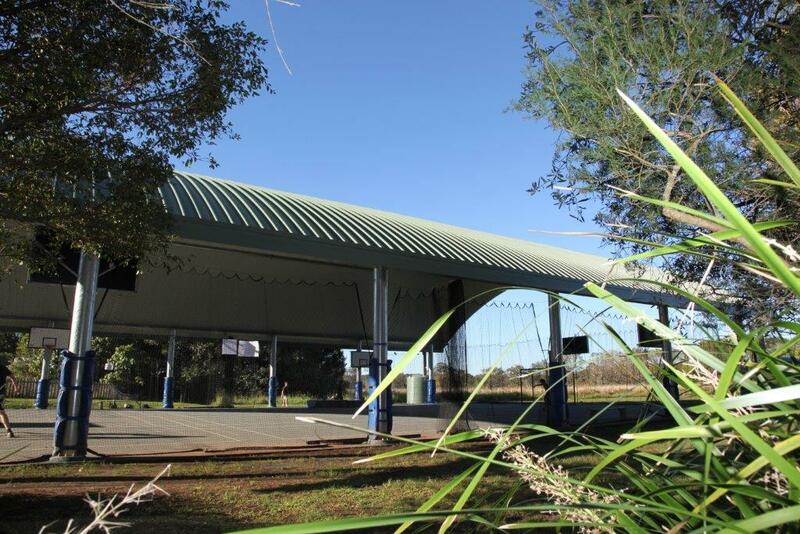 Sports equipment includes padding for all columns, rotating basketball-netball towers, plus additional practice basketball backboards on four columns at appropriate height to suit primary and secondary students. The retractable perimeter nets prevent balls from escaping into the adjacent wetlands. The court was painted by Action Tennis in the very appropriate colour, “Byron Blue”.